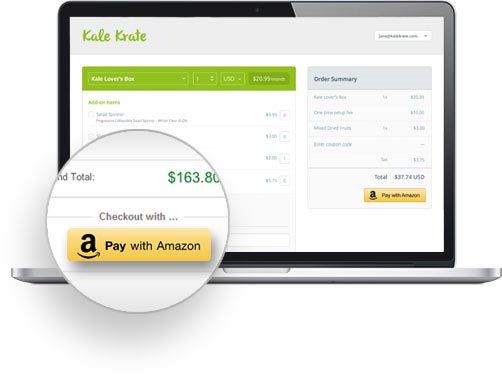 Add Amazon Pay to your Recurly store and let millions of Amazon customers shop on your website. Companies of all sizes appreciate that managing recurring billing is significantly more challenging than processing one-time payments. As the leading self-serve, pay-as-you-go recurring billing platform, Recurly ensures setup is easy, integrations are quick, and our service scales with the needs of your business. And now, Recurly’s Amazon Pay integration allows millions of Amazon customers to set up recurring payments on your website with the information already stored in their Amazon account. It’s fast, easy and secure, and helps you add new customers, increase sales and reduce fraud costs. Leverage the trust of Amazon to grow your subscription business. Empower your customers to easily establish a recurring payment relationship with your business. With recurring payments functionality from Recurly, you can establish ongoing payment relationships with your most loyal customers. Go beyond the transaction and build deep customer relationships, all while leveraging the convenience and trust that Amazon provides. Built for businesses large and small, Amazon Pay for Recurly is an easy-to-install and robust solution.